Annabella Nyiramahoro blocks Kyaddondo East MP Robert Kyagulanyi Ssentamu aka Bobi Wine from accessing Parliament with the red ribbon during the age limit debate. File photo. The former officer in-charge of Parliament, Anabella Nyiramahoro, is to head the new Parliament Division in the latest shakeup of police leadership by the Inspector General of Police, Gen Kale Kayihura. Kampala Metropolitan Police Spokesman Luke Oweyesigire confirmed the appointment and said Ms Nyiramahoro will head the newly created division. 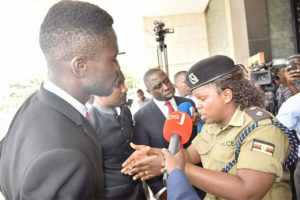 Ms Nyiramahoro, who is known for her tough stance on protesters seeking to illegally access Parliament, is famed for blocking Kyadondo East MP Robert Kyagulanyi aka Bobi Wine from accessing the House chambers with a red ribbon during the Age limit debate. In the reshuffle, AIGP Lemmy Twinomugisha, who has been heading parliamentary police, has been appointed director of Welfare and Production. He replaces Mr Haruna Isabirye, who moves to the Human Resource department as the head.